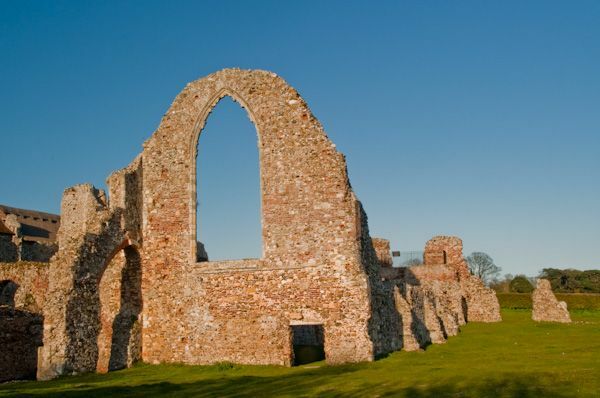 Leiston Abbey is the impressive remains of a 14th-century Premonstratensian abbey, one of the best preserved monastic sites in Suffolk. 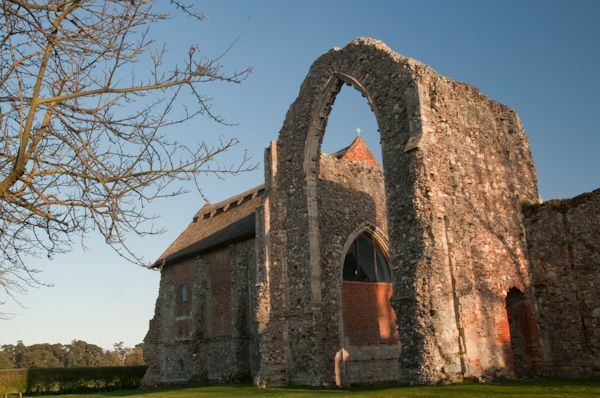 The abbey ruins include the thatched Lady Chapel, which is still sometimes used for worship. 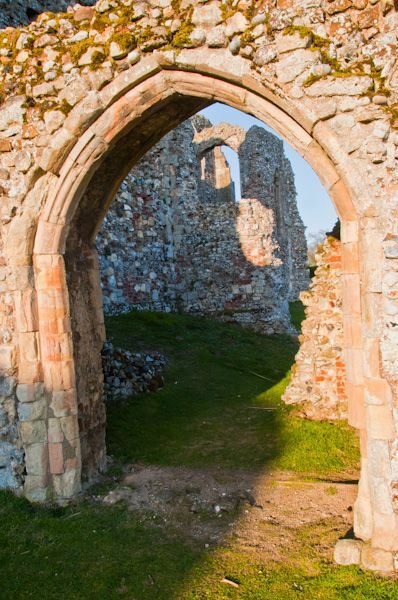 Leiston Abbey was first established at a site near Minsmere in 1182 by Ranulph de Glanville, Lord Chief Justice to Henry II. 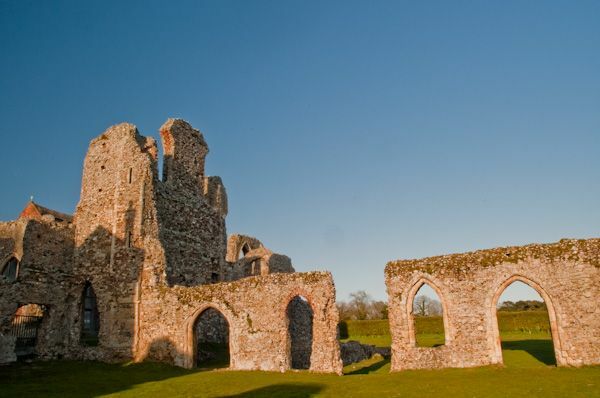 The original site proved to be prone to flooding - not too surprising, given the low-lying ground - and as a result, the abbey was relocated to its current position in 1365 under the patronage of Robert de Ufford, Earl of Suffolk. By that time the abbey had become a house of Augustinian canons after the Premonstratensians were absorbed into the Augustinian order. Unlike the Cistercians, who withdrew from the world to a life of contemplation, the Augustinians focussed on a life of preaching and interacting with the local community. 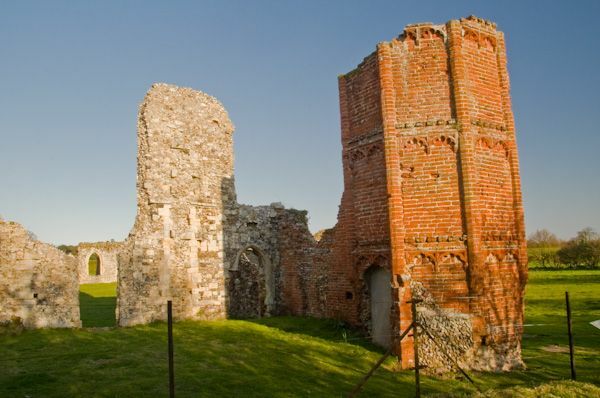 The old abbey buildings near Minsmere were dismantled and re-used at Leiston, with the result that you have a 14th-century abbey with 12th century Norman stonework. 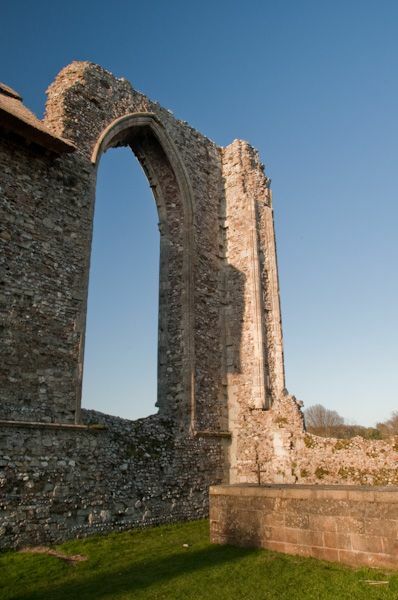 The abbey's domestic buildings were badly damaged by fire in the 1380s and had to be rebuilt. After the Dissolution of the Monasteries, Leiston was granted by Henry VIII to his brother-in-law Charles Brandon, Duke of Suffolk. The monastic buildings were largely demolished, and a farmhouse built onto the ruins of the abbey church, while the church itself was used as a barn. The farmhouse was later given a more fashionable Georgian facade. 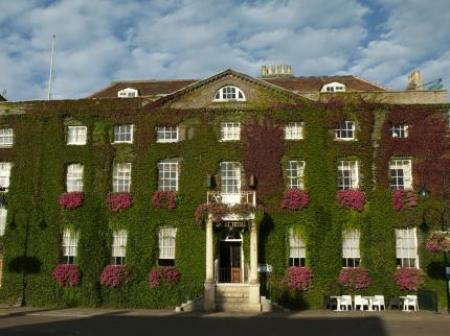 In 1928 Ellen Wrightson bought the abbey site and converted it for use as a religious retreat centre. When she died in 1946 she left the monastic site to the Diocese of St Edmundsbury and Ipswich. 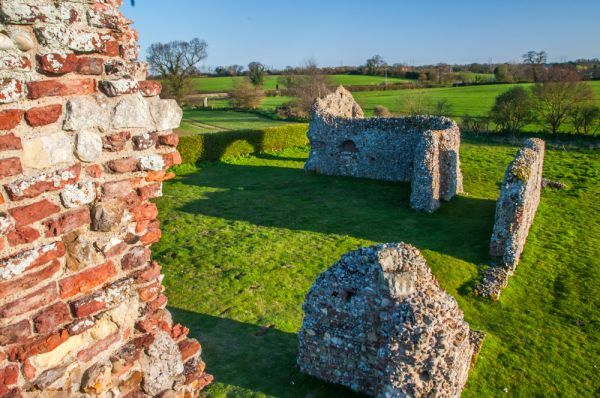 The house is now used by the Pro Corda music school, but the medieval monastic ruins are administered by English Heritage, and the site is free to explore at any time. The remains include the walls of the abbey church and associated buildings, with earthworks and a moat. 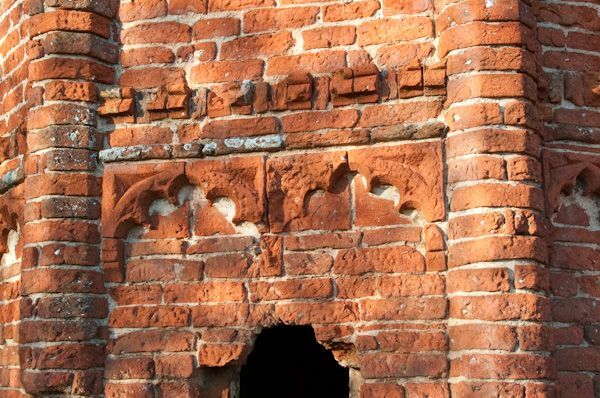 The most impressive remain is probably the 16th-century brick gatehouse with its octagonal brick turret. To the north of the gatehouse is the cellarer's range, used for storing foodstuffs. You can see the cloister, with a place for washing hands on the north side of the square. A set of stairs lead up to what was once the refectory. On the east side of the cloisters is the warming house, sacristy, and chapter house, where the daily business of the abbey was conducted. The remains of the abbey church are on the north side of the cloister. The best-preserved part of the church is a huge north transept arch, which gives some idea of just how impressive the church must have been when new. Beside the north transept is the thatched Lady Chapel, which has been restored and is occasionally used for worship. 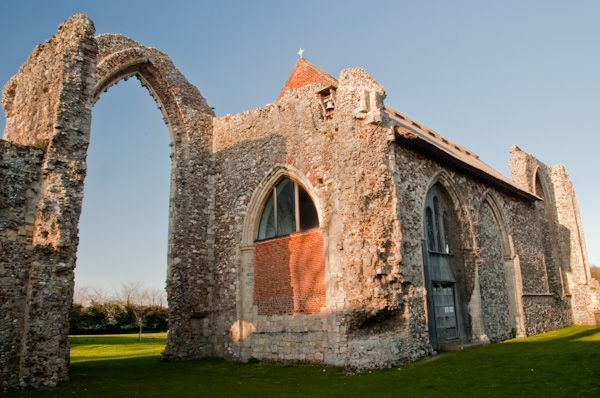 The original site of Leiston Abbey (cleverly called 'Old Leiston Abbey') is located 3 km to the north-east. During the mid-16th century a terrifying tale spread throughout East Anglia, a tale of a huge black dog that roamed the countryside and terrorised the local population. The dog became known as Black Shuck, or Old Shuck. As the tale spread the description of the dog became more dreadful. It was said to stand 7 feet tall, with flaming red eyes, razor-sharp claws, and matted black fur. A single glimpse of the dog was said to be fatal. If livestock disappeared, Black Shuck was blamed. If someone was found dead, the hell-hound was held responsible. Black Shuck was said to burst into churches during services and kill the worshippers. 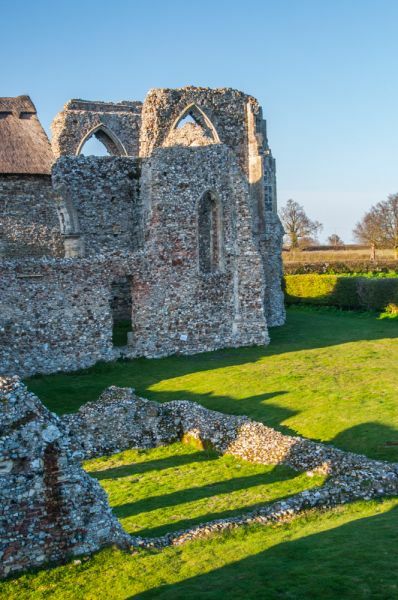 The dog's most infamous attack came at Holy Trinity church in Blythburgh, where it burst into a service, killed a man and a boy and causing the steeple to collapse. You can still scorch marks on the door said to have been made by Black Shuck's claws. The fearsome dog then repeated the attack at St Mary's church in Bungay. Folk memory of the attack lives on today, for the figure of a black dog has been incorporated into the Bungay coat of arms, and the local football team is known as the Black Dogs. Was Black Shuck just a folk tale, a blood-curdling story told around a winter fire for entertainment? Well, maybe not, for in 2013 archaeologists digging at Leiston Abbey found the remains of a huge dog. Examination of the bones suggested it would have stood 7 feet tall if it stood on its hind legs, and it would have weighed over 14 stone (roughly 200 pounds or 90 kilograms). The dog had been buried in an unmarked and very shallow grave over the site of the abbey's kitchens. Pottery sherds found at the same level as the dog bones suggest a date in the mid-16th century, around the time that Black Shuck is said to have made his terrifying attacks. Is this proof that there was some truth behind the dreadful tales of Black Shuck, or is the answer much more mundane? Perhaps the bones are those of a hunting dog favoured by one of the last abbots of Leiston, or perhaps they are something more. Location: Off the B1069 north of Leiston village. In the grounds of Pro Corda Music School.